 Poe, a distant relative of Edgar Allan, follows up his debut psychological thriller, Return to the House of Usher (1996), with another variation on a classic Poe story, again set in Crowley Creek, Virginia. Returning as protagonist is John Charles Poe, also a distant relative of Edgar Allan, who writes a ``barely syndicated'' column for Fannie Boynton's Crowley Creek Sentinel and who's inherited a brassbound oak casket bearing the papers of the great dead writer. It appears that Margaret Cully, the wife of the veterinarian, has vanished under mysterious circumstances; Julie Noir, a waifish raven-haired girl with a tiny gold stud in her nose, shows up and quickly replaces Margaret in Dr. Cully's clinic; and John Charles seems to be haunted by a small black shape that follows him around. Julie, who carries her black cat Asmodeus about on her shoulder, advertises the fact that she fancies herself a witch. After John Charles helps Dr. Cully deliver a two-headed calf (in the best scene here), the bad omens begin piling up. When Poe's story of ``The Black Cat'' seems to be coming to pass in Dr. Cully's own person, John Charles opens his cache of Poe letters and notes, looking for insight. Julie holds moonlit rites and dances naked, and the Reverend Rollie Fairchild whips up the town's antiwitch fever. Finally, Julie discovers a buried ax, seemingly having the missing Margaret's hair and blood on it. A town meeting is called, and some demand that Julie be arrested--or at least run out of Crowley Creek. (The town's rabid feelings are the plot's most feeble device.) Then Dr. Cully starts hearing rats in his cellar behind a freshly bricked wall. 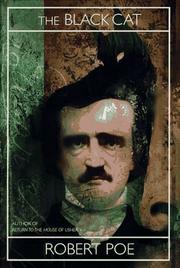 John Charles has a drinking habit meant to mimic Poe's, but Poe had an allergy to, not a craving for, alcohol. Gentlemanly, undemanding variation on the master's work.